So here I am, at Day 357 of my journey. Just one more week after this, and my progress through Final Fantasy XIII is coming along nicely. I’m nearly through chapter 9 of 13, and if memory serves the game is about to feel a whole lot bigger as I make my way to Gran Pulse in chapter 10. I’m not done just yet though, so please stick around for my final two standard updates. A lot of plot has happened in my last seven days with Final Fantasy XIII. Hope’s frustration with Snow came to a head, Sazh learned the truth about his son and the role Vanille played, and Lightning started to soften just a bit and warm up to Snow following her bonding with Hope. Let’s touch on a couple of those moments, shall we? Let’s start by talking about Sazh and Vanille, and their trip to Nautilus. Before I get into the nitty-gritty of the drama that unfolds, I just have to take a moment to whinge about Nautilus as a whole. When you arrive at the theme park it just screams “MODERN-DAY GOLD SAUCER”. There’s the stunning Eidolons on Parade event going on, park attendants that tell you of upcoming attractions, and even one that says, “Sorry, this ride isn’t open to the public just yet.”; a common Final Fantasy trope to keep you from entering a particular area until you’ve progressed far enough in the game. On top of that there’s one section of Nautilus that looks like a gateway to other areas of the park, with 7 or 8 paths spiraling around with gates at the end of each one. Of course you can’t access any of them, and must continue from the way you entered the screen directly to the exit on the opposite end. Hell, this place has even got a chocobo corral that you spend some time in, while Sazh’s chickabo plays with his brethren briefly. It’s a cute moment, but that’s all it is; a moment. There’s not chocobo racing, or even riding around for fun; there are no mini-games to waste time with; there is literally nothing to do here but admire the flashy lights and move on the the big moment at the end of the chapter. If feels like such an incredible waste of the theme park, and it’s really disappointing. Anywho, that big moment I mentioned is one of the only moments from Final Fantasy XIII that really hit me when I first played it six years ago (holy hell, has it really been out six years already?? ), and one I remembered vividly. There are a lot of forgettable locations and moments throughout the game, but Sazh’s struggle with what had happened to his son was so intense and well executed. 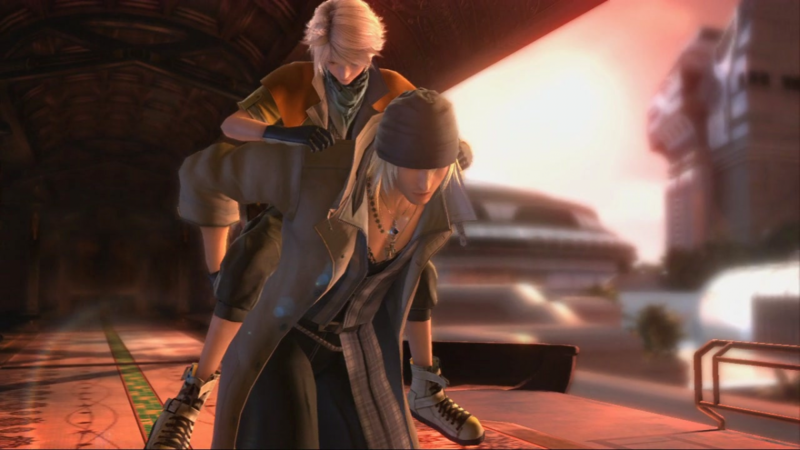 After seeing flashbacks of Sazh and Dajh together and learning that Dajh had become a l’cie was pretty crushing itself, being the young boy that he is, but then to watch as he crystallized in Sazh’s arms was heartbreaking. Even worse (better?) was when the out of nowhere Jihl Nabaat (seriously, who the heck is this chick?) revealed that Vanille was to blame for Dajh becoming l’cie in the first place. Sazh’s subtle but fervent rage was obvious, and watching this fun, charismatic, laid-back dude nearly kill his young, petite travelling companion for taking his son away was just, I mean, wow. Then when he can’t do it, and instead puts the gun to his own head? Man. It’s honestly difficult to put into words. To say it was moving would be cliché and does not do the scene justice, but it really is moving. Many other games in this franchise have had dramatic moments and jaw-dropping twists, but none realized in such beautiful graphics like this. When Cid “sacrifices himself” and jumps out of the airship in Final Fantasy IV to seal the hole in the ground with a massive explosion; when Red XIII sees his father for who he really is in Final Fantasy VII; when the Dark Knight in Final Fantasy II is revealed to be Leon, Maria’s brother. These moments were all dramatic and touching in their own ways, but just imagine if you could experience them with modern-day graphics. This is, in truth, the biggest reason I am looking forward to Final Fantasy VII Remake. That game has so many amazing moments in it, and I can’t wait to see how much more intense and emotional they will be on the current generation of technology. Getting back on track, Sazh’s depressing moment in the spotlight is one of my top favorite Final Fantasy moments ever, and it’s a scene I won’t soon forget. But that’s not the only major event from this week. 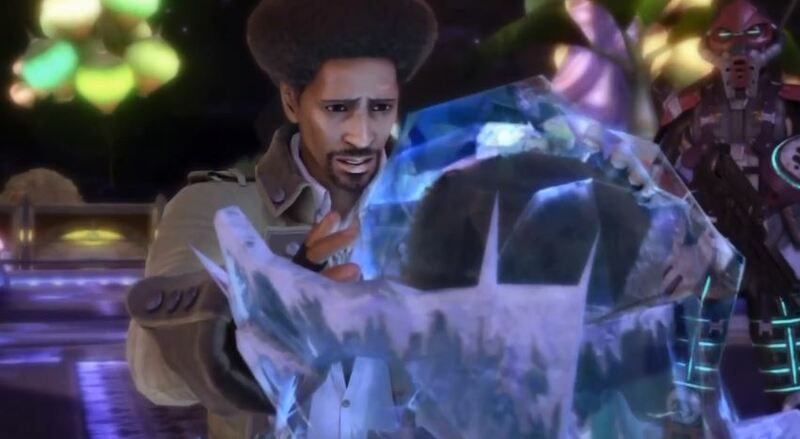 After weeks (or days, going by game time) of Hope holding a grudge against Snow for indirectly causing his mother’s death, he finally had his chance for confrontation and resolution. When push came to shove the entire event was… not. They had a verbal back and forth where Hope tween-raged at Snow, and Snow apologized by saying apologies won’t cut it. It looked like Hope’s anger was about to summon forth his Eidolon, like what happened with Snow, Lightning, and Sazh before him, but the moment was cut short by an explosion from PSICOM as the rogue l’cie were being chased down by the military. The two had a great tumble over a ledge, Snow hanging onto Hope and breaking the boy’s fall – protecting Hope, just as he promised Nora he would. Their fight was underwhelming, but Snow’s redemption was admirable. I still feel like that would have been the ideal moment for Hope to fight Alexander (his Eidolon), but alas, that shall wait for now. You might notice a running theme among the moments I’ve touched on today: family. Looking back at the Final Fantasy series I’ve noticed that each title has an overarching theme, whether intentional or not. FFIV is a tale of redemption. FFVIII is all about friendship. FFXII pushes the importance of truth and consequences, and one of FFXV’s main themes has already been touted to be brotherhood. Final Fantasy XIII’s theme is most definitely family. Sazh and Dajh. Snow and Nora (plus his mended relationship with his father). Snow, Serah, and Lightning. Fang and Vanille. They’ve all got family they are fighting for, fighting with, or depending on, and the biggest moments all revolve around the importance of their families. I don’t have much more to say on the matter – it’s mostly just an interesting observation. As I wrap up my marathon in the next week or two, it will be interesting to go back and reflect on each game, trying to work out what the theme is in each title. Even if I don’t come up with one for each game, it will still be great to re-read my past stuff and look back on my year of Final Fantasy. Please join me for my conclusion of Final Fantasy XIII next week, along with a wrap-up post to come in the new year. For now, keep following until the end with my live tweets on the hashtag #RoadtoXVin15.